Enendu is an international student from Nigeria with a long history as an integral part of the campus community. In addition to being an active member in multiple cultural and identity clubs, she currently works as a peer mentor in the Diversity, Equity, and Inclusion Center, and is also a member of the Campus Activities Board, where she helps organize student events and cultural activities. Enendu enjoys working with children and is currently in the first year of the SPSCC Nursing program; she aspires to become a pediatric nurse. Williams works as an Event Coordinator for the Campus Activities Board, helping coordinate community and outreach events such as the Day of Caring at the Thurston County Food Bank. She is an active member of several student clubs and is currently working on finishing her Associate in Science degree to pursue a career in naturopathic medicine. 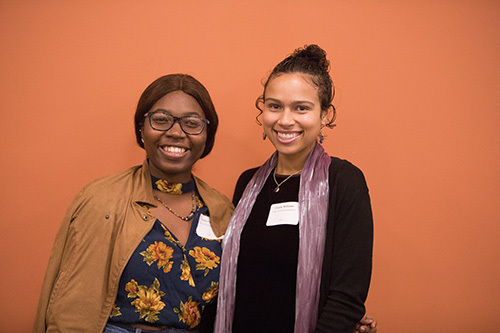 Enendu and Williams were awarded youth scholarships at the annual Martin Luther King, Jr. Banquet sponsored by Olympia Federal Savings, SPSCC, and the Thurston Group. In addition to the scholarship awards, nearly 300 banquet guests enjoyed various guest speakers, a keynote address from Artist & Lecture Series speaker Dr. Walter M. Kimbrough, and a dinner prepared by Culinary Arts students.